its best hack !!!! you can use hack in close your eyes !! I DONT know how to work this it won't let me log in it is frustrating me! what is going on with this Loader the INJECTOR was better like wtf did this evolve to. its telling me my account doesn't exist when it does! You need to keep both 32bit and 64bit loaders, check in both if you can't find a hack you want to use. 32bit is usually for older games while 64bit is for newer like GTA5. Subscribe to these channels - or you might crash! It's recommanded to extract the loader in C:/test, especially if it isn't working! Just make a folder in C:/ named "test" and put the loader in there. 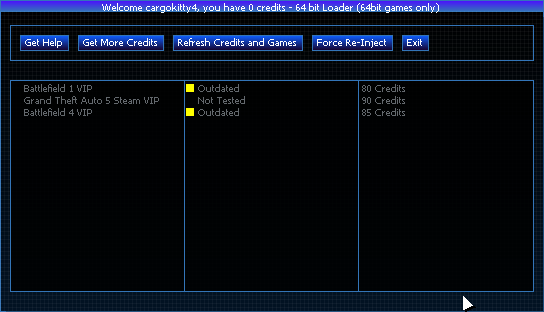 To use any of our VIP hacks, you need to buy Credits! 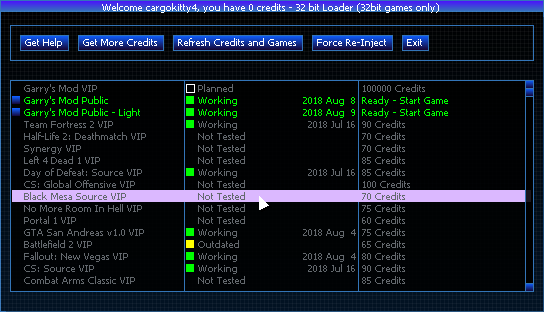 You do not need credits for our Public/Free hacks. BigPackets Error - press CTRL+C and Post on Support Forum!! Failed to download the sound for C:\Users\Kacper\Desktop\clients_version2569 (1)\kitterengine\button.wav from the BP site, this is safe to ignore. i have download the link but when i want to unzip the files i have only (bigpackets is pass) in my folder ! and i can run the app in the zip folder !! can you help me pleaaaaassseee. I'm coming back to Gmod and wanting to use this wonderful cheat but now my antivirus/firewall keeps deleting the 32bit and 64bit apps. I've disabled them but the files still get deleted. Any fix on blocking them from getting removed?